What?! You're not splitting wood - you can't be - you're a girl! Well, yes, I am a girl, but yes, I was splitting wood today - but not with an ax. There is no way I am confident enough or strong enough - so don't worry. We have been heating our house with wood for the last couple of years but until two years ago, we always had an oil burner as a backup source of heat. Oil as a fossil fuel was just not something we wanted to burn in our home any longer. The old burner was a good one in it's day but that was a long time ago and we all know that we cannot continue using petroleum products forever. 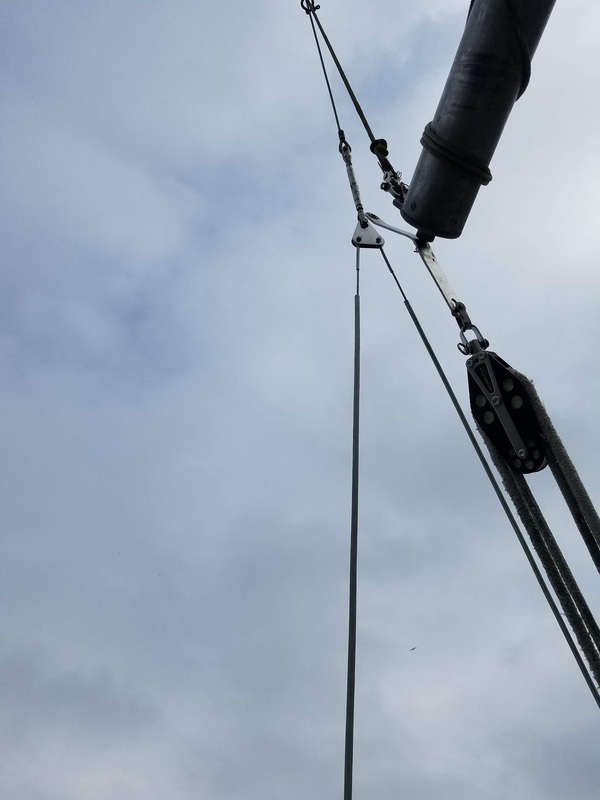 We decided that our long term goal was to use solar as our backup source of energy for electric heat and that we were ready to ditch the boiler. We knew wood was a good renewable energy source as long as we burned it properly. Our home has a beautiful stone fireplace that was built by a well-known stone mason in this area, but fireplaces are not efficient or practical to use for heating a whole house. 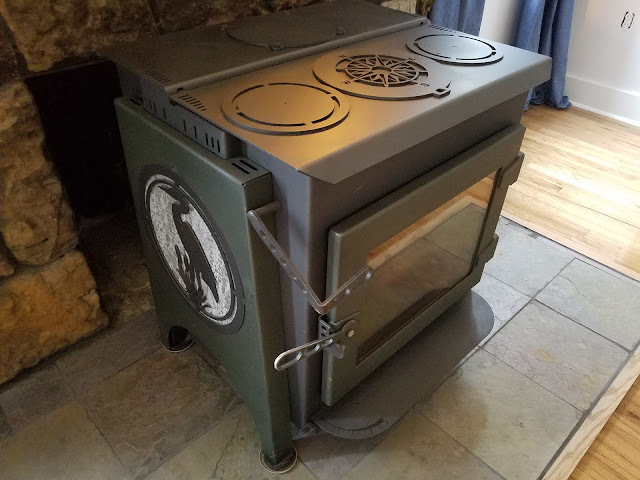 We did get a big cast iron fireplace insert given to us a few years back, but it was a brute and sucked in the wood like spaghetti. While doing some research on efficient wood stoves, I stumbled across a Popular Mechanics article where they were showcasing the results of a clean burning wood stove competition. The overall winner was the Ideal Steel Hybrid made by Woodstock Soapstone. It was just what we wanted, a highly efficient, reasonable priced, low emission stove. 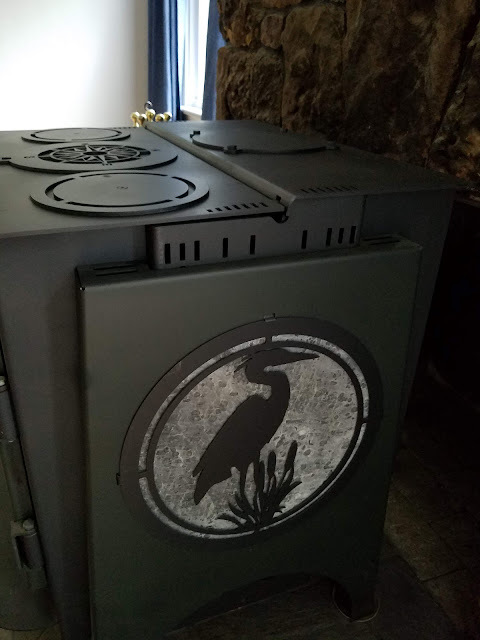 This will be our fourth year with the really amazing stove. 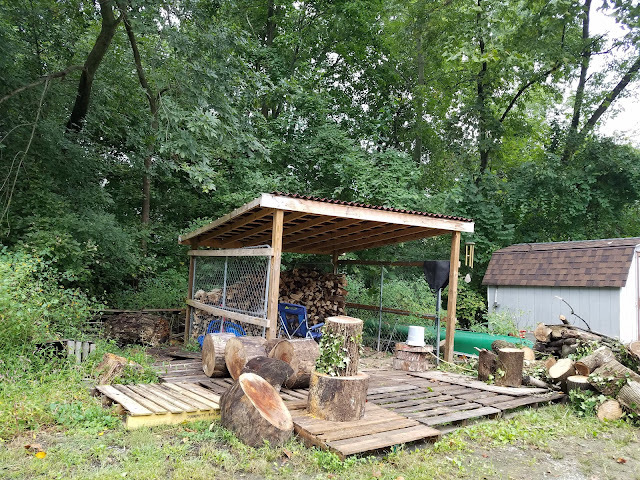 Last year, Eric built a wood storage enclosure where we could stack wood out of the weather but in the sun and wind for optimal seasoning. We figure that it holds four cords of wood, which is enough to heat our home for a winter. 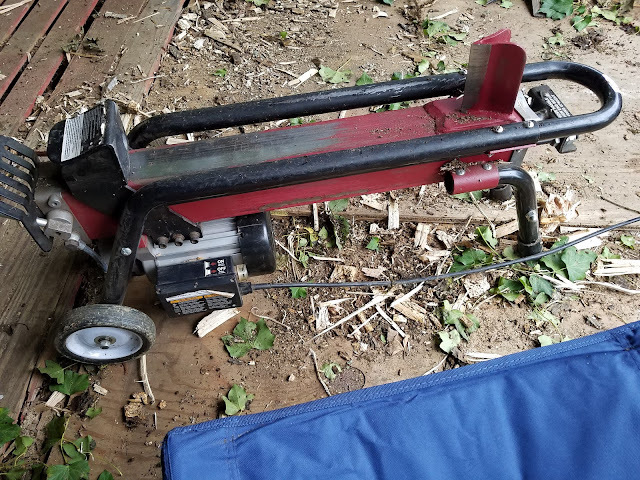 Last year, we also didn't spend any money on buying wood, just using the trees that we had dropped on our property to make room for the house lifting machinery. 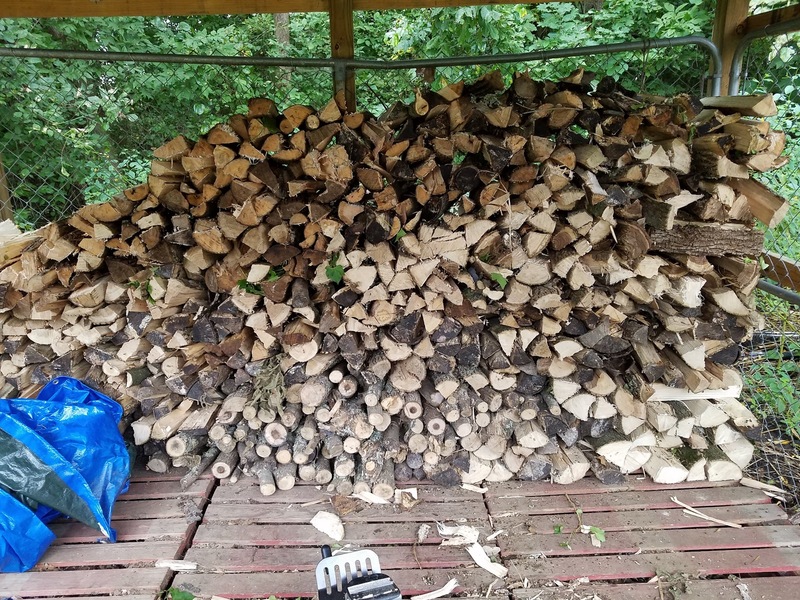 Of course, Eric had a chainsaw and a splitting mawl but since the logs were green and not seasoned, splitting four cords by hand would have been so much work. Our solution? Buy an electric splitter. Why? Well the reviews were fantastic. The price was much less than a gas powered splitter. We hated the noise level of the gas splitters, and I wanted to be able to contribute more to the effort. The big question was, could it deliver? We placed our order and within a few days, our cherry-red, Boss Industrial 7-ton electric splitter was in our driveway. Last year, we sat on our patio and fed the twelve to twenty-inch wide logs into the splitter and it just kept working. We could sit and talk while we worked, and before we knew it, we had our wood shelter filled up. No gas cans, no oil, no noise - we loved it! 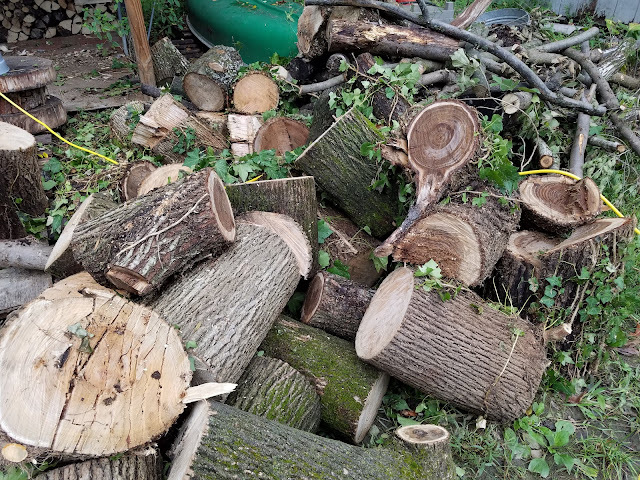 Yes, there were a couple super heavy and wet sycamore and black walnut logs that refused to split, but we set them aside to dry more and split them later. I love telling people that I am out splitting wood. There is always that pause...Wait, what? 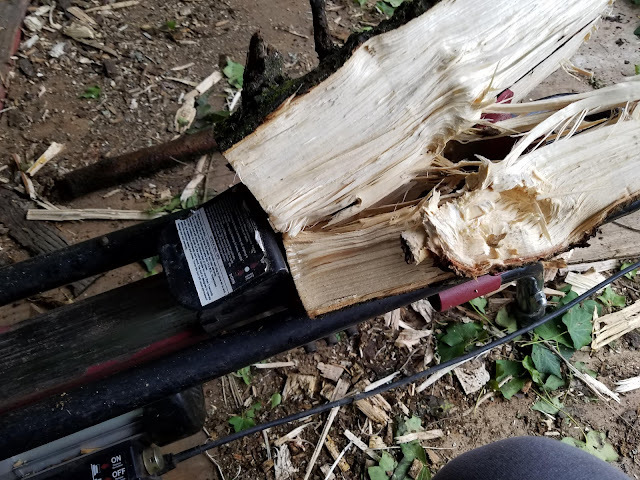 And then I go on to explain that no, I am not an ax-wielding crazy woman, just a happy one sitting outside pushing the lever of the clean and quiet machine that renders dirty, twisted and gnarly logs into clean white fresh smelling chunks of wood that I can easily handle. 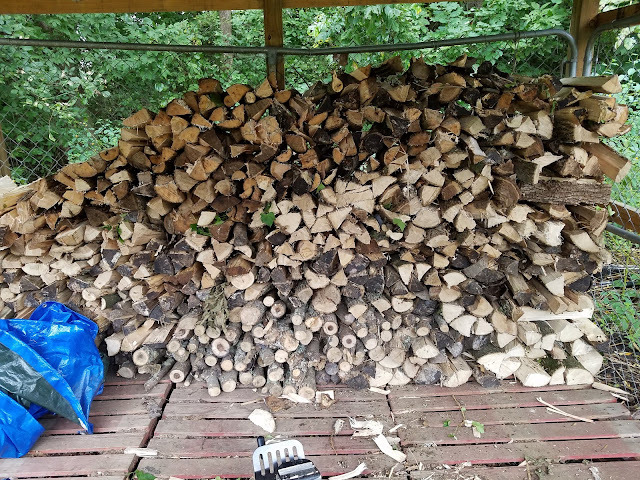 After a few months of sitting in the fall sun and breezes, the wood burns clean and hot and thanks to our efficient stove with almost no emissions to harm our atmosphere. What? Are we hippies or something? Living in the bush? Do we use one of those huge antennas mounted to our roof? We are free from a land connection! Eric and I had many reasons for changing from being a cable customer to a cord-cutter. 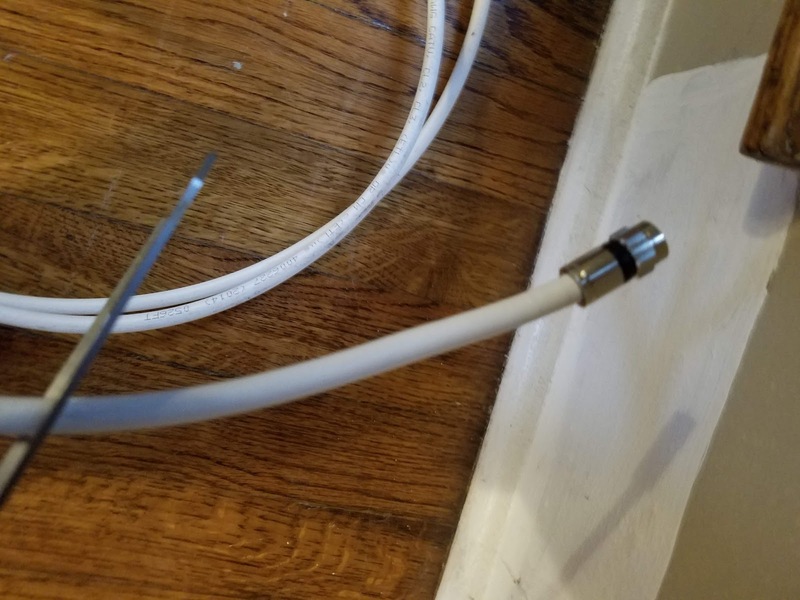 By a cord-cutter, I am referring to a person who no longer relies on a cable (or cord) that is wired into the walls of their home for internet and television service. We used to be a cable customer as it was our only choice, but I was very frustrated with the service for many reasons. Poor quality television programs, poor customer service, the costs were too high and so on. We have talked to so many people who, like us, couldn't figure out another method. Even in St John, British Columbia we had great internet connection. Eric here having fun! Trapped until last spring, when we were planning on moving out while our house was to be lifted. We knew our cable subscription would have to be cancelled at least temporarily as we had no cable hookup in our temporary quarters in our sailboat. 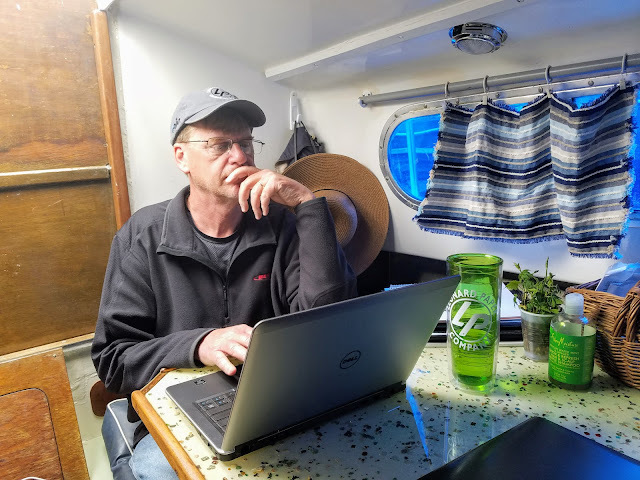 We could not be without internet for several months as Eric works from home and almost all of his communications are online. Since I am a writer, obviously the yellow notepad was not going to cut it. As the deadline for our house lift approached, the need to find a solution for internet and television access grew increasingly stronger. 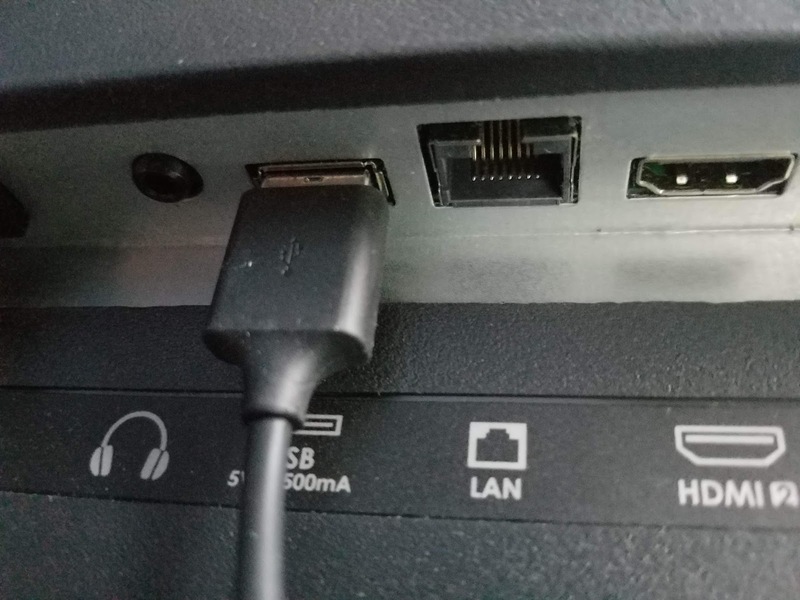 One day, I had the simple idea of just unplugging our cable connection and see if I could figure out how to use my smartphone as a hotspot instead of using our router that fed a signal from the cable box to our television. Plenty of websites explained how I could turn on the software already installed on my phone and broadcast a wireless signal to my laptop. Sure enough, it worked! 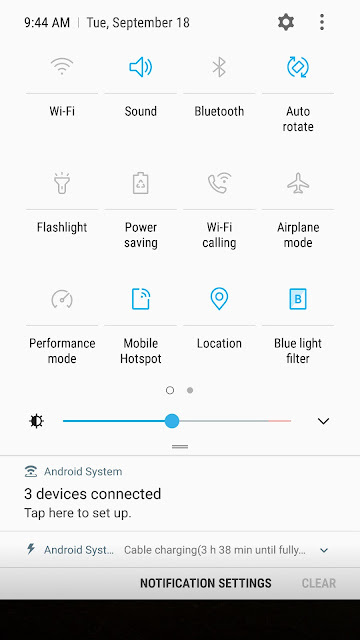 Here you can see my settings page where the option for Mobile Hotspot is highlighted. I can hear all your voices clamoring as you argue with this method as using up way too much data, as data is so expensive. Well you are right. Data was expensive, so I had to compare the new option with the costs of paying for cable and phone. Well, the new option was just a little more expensive but I still did not have television. I was happy to know how the connection could work and freedom from cable was in sight! I scoured T-Mobile's website on their plans, their data limits and charges, and found that they did have a plan for unlimited data. Yes! That was one limitation gone. Now what about television? I saw that I could use mirroring, which is basically using your television as a monitor for your phone. I could see on the television screen whatever was on the screen of my phone. We used that method for a week or so, but I was still not satisfied. 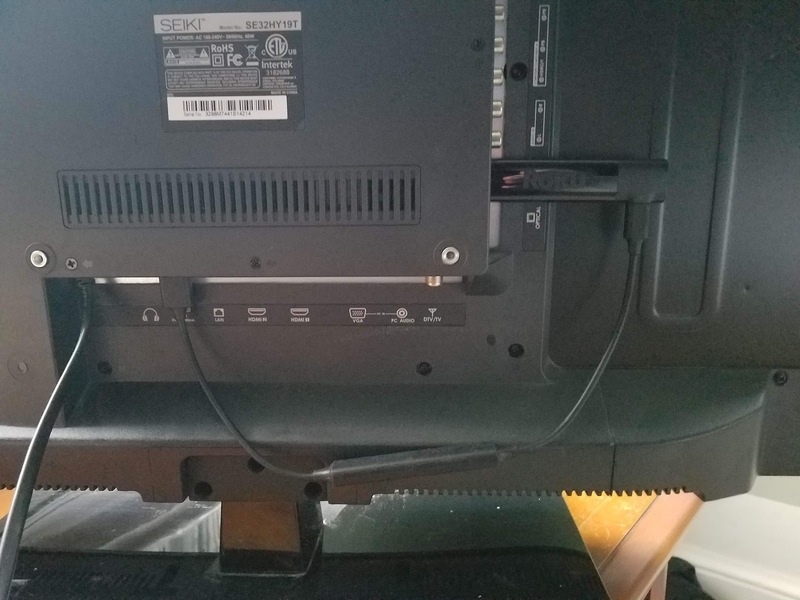 At this point, we could also watch television on our computers using the phone as a hotspot. This in itself was awesome as we could travel anywhere and as long as our laptops could power up, we could access the internet. Once in a while, we would lose signal on our phones but that became more rare as T-Mobile kept increasing its coverage area. Time to cut the cable! 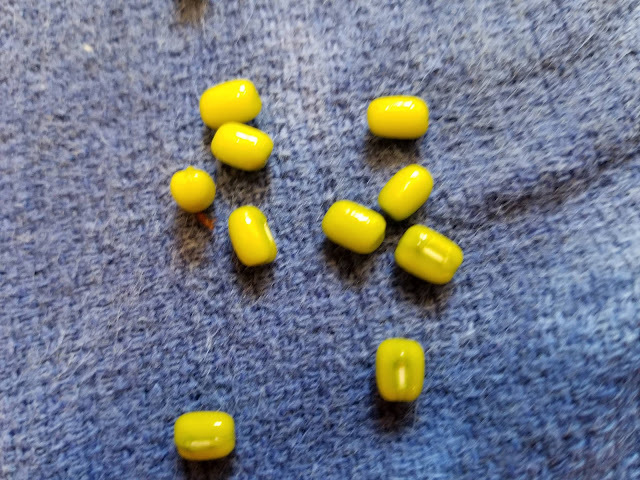 I feel like this blog is a commercial for T-Mobile, but I am just trying to explain how we were able to successfully cut the cord and am not being compensated by T-Mobile. 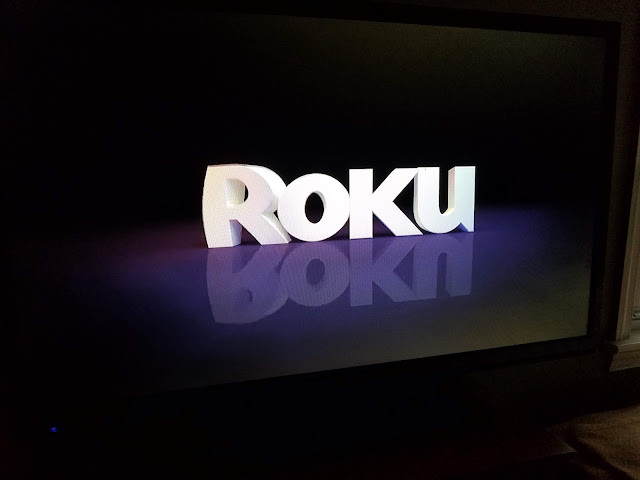 So, anyhow, then we discovered that we could use Roku as a receptor for our mobile hotspot signal that would input to our television anything we wanted. We didn't need a router anymore. 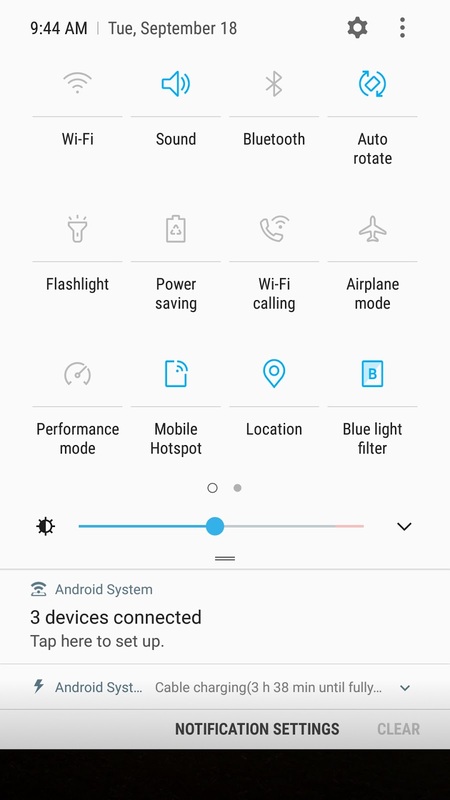 Here is how it works for us: I turn on the hotspot on my phone under the settings - the first time you do this you will have to set up a password so that not everyone has access to your data plan. Next, I turn on the television and go to Input. I click on the HDMI source that I plugged the Roku stick into and the television will begin broadcasting any channels we have subscribed to including Netflix, Amazon Prime Video, YouTube and so on. The Roku stick comes with a remote that I pair with our television so it will also control the power and volume. At home, we leave the Roku stick in place and so our television automatically opens to our Roku homepage. This method works wherever we travel as well. 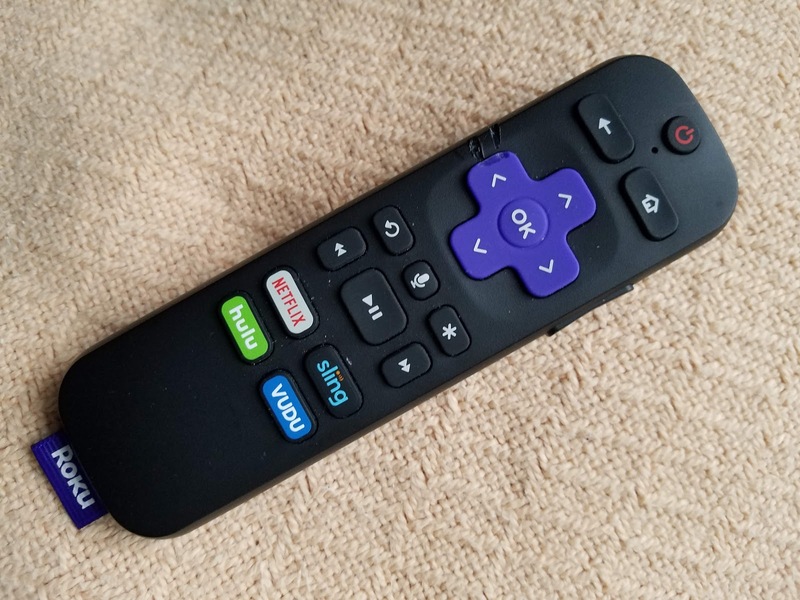 We bring our Roku stick and remote with us for overnight stays. No more flicking through hundreds of hotel cable or dish television channels and putting up with stupid commercials. Back to the data problem. The whole issue with unlimited data was that the small print in the phone companies' data plans always mentioned that after so many gigabytes, the speed would drop. 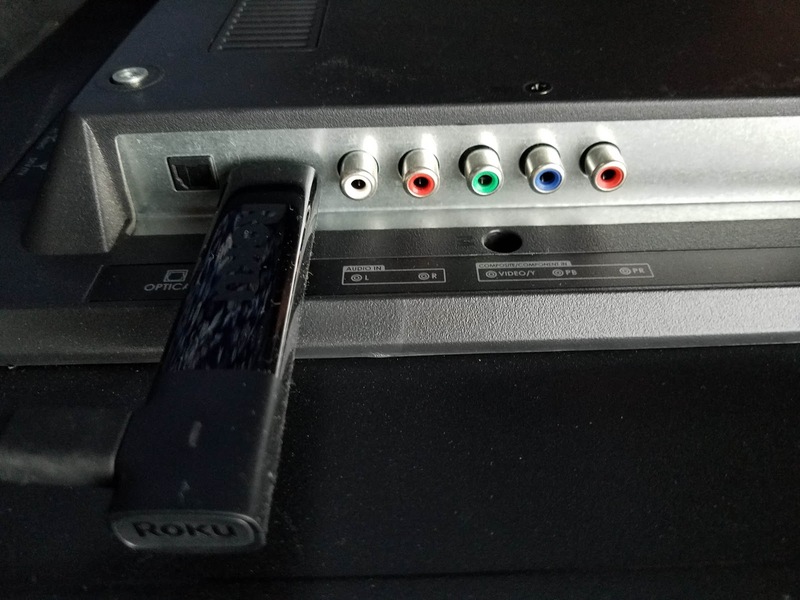 Now that was not really that much of an issue as the Roku stick could buffer shows and then play them at regular speed. High definition was where we saw the problem. 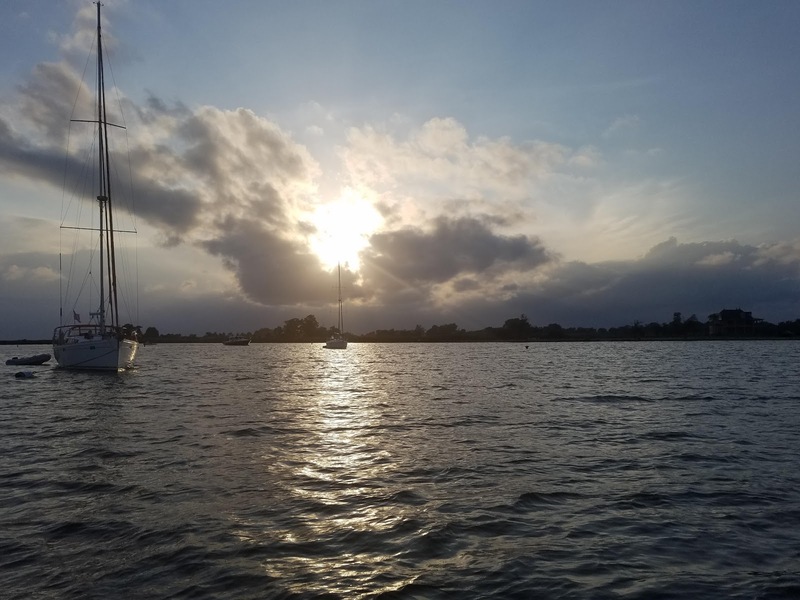 A few months went by and our sailboat stay was very successful. 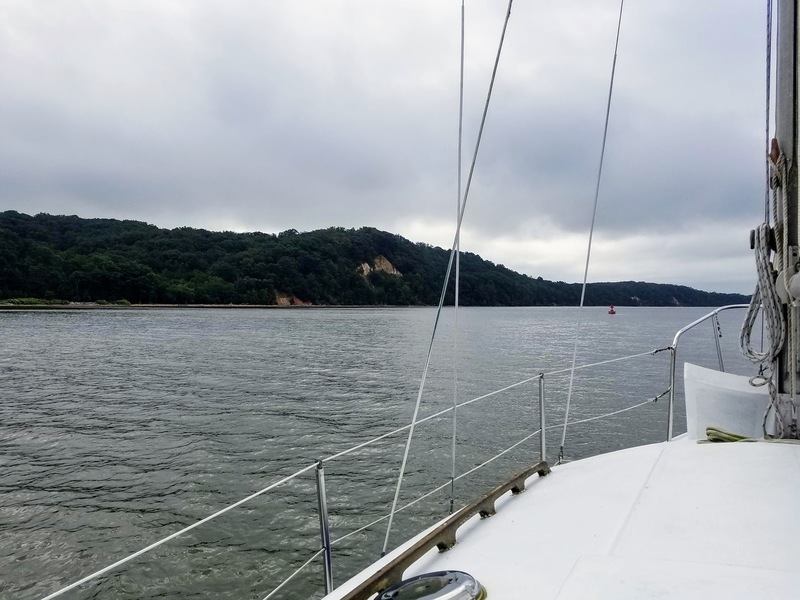 We had a midsize television mounted in the center of the boat and we had great phone reception so our internet service and television watching were almost seamless. When we moved back into our home and switched back to using a larger monitor, we were surprised to see the lack of definition. So now I have spilled the beans and our secret to freedom from the cable is no longer a secret. What a pleasure we have found in watching shows that we choose, without commercials, and can watch when ever and where ever we like! And, oh yeah, the cost we now pay for our two smartphones, with unlimited data, high speed and high definition for television and internet is now less that we used to pay to our cable company and phone company combined! For those curious folks, we pay $95 a month, that includes everything except for our actual phone leases (as of 9/2018.) How much data do we use? Last month - 267.42 GB, 941 phone minutes and 2688 text messages. Now our next step is to get an even more efficient LED television monitor that has 4K capabilities so that we increase our quality of picture while decreasing our electric charge so that we can use solar to power our phones and television. It's nice to be free to travel and still be connected when we want. Here we are in Dingle, Ireland. Just last week, I read an article on how impossible and unrealistic it was to try to survive without a physical hookup for internet and television whether to cable or dish, and I had to chuckle to myself as we are living proof that you can be free from the dreaded cables.We certainly enjoy our setup and highly recommend you explore your options. But wait! What about watching sports? Well, we are not sports fans, but have found whenever we need to watch something important like the Super Bowl, there are streaming channels available for us to use on Roku. This last spring, Eric and I were so excited to get busy planting. We couldn't wait for the warm weather and started planting seeds indoors. I bought an LED plant light and set up a mini greenhouse to use in our basement. Our hopes were grand and Eric talked about the waste of growing grass that we had to maintain when we could be growing vegetables and fruits. It was a lot of fun to dream! 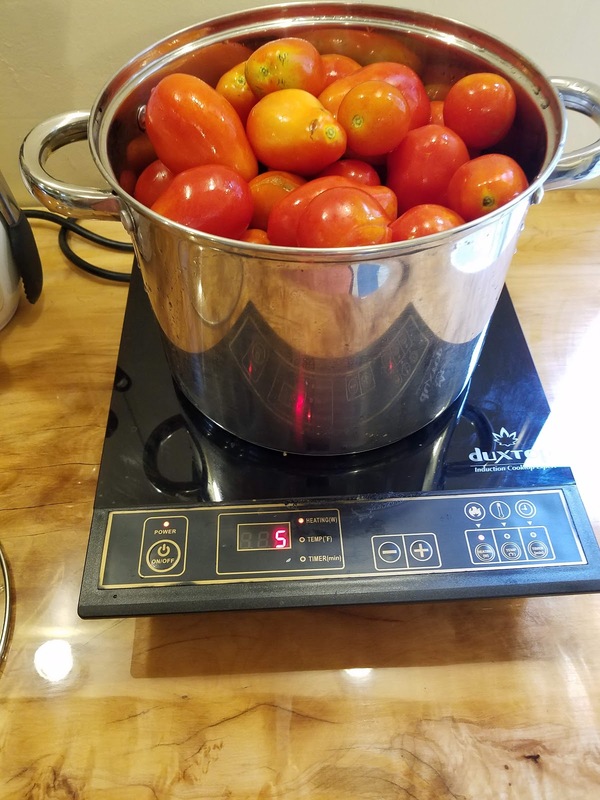 Cooking tomatoes for winter tomato paste. We have about half an acre that is not already planted with trees or part of the stream that runs through our yard and most of it was grass. Eric started dropping sheets of cardboard over the lawn closest to the house and then covering it with yard compost or hay. 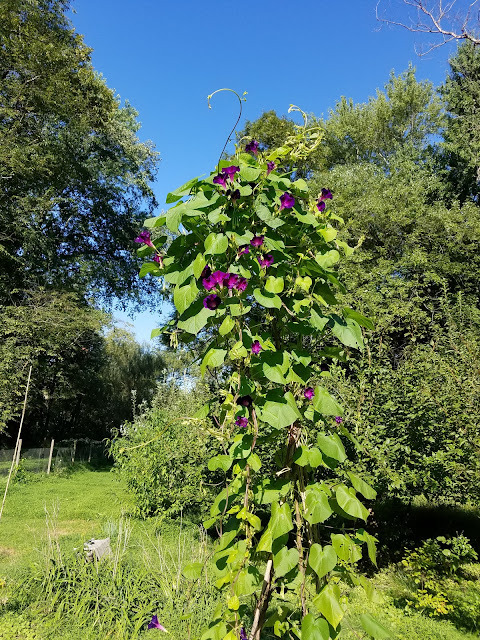 By the end of May, we had just about everything in the ground. 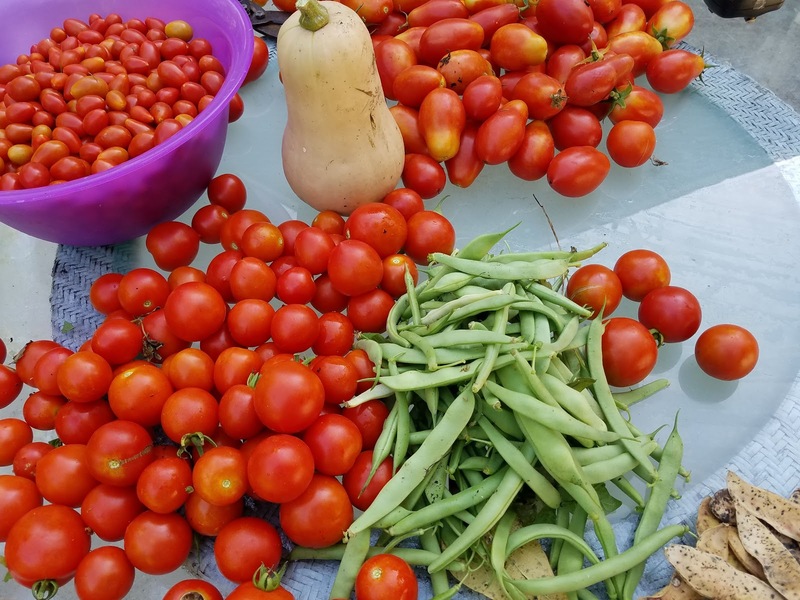 Three kinds of tomatoes, potatoes, four types of beans,beets, Swiss chard, onions, kale, cabbage, basil, English and pickling cucumbers, herbs galore and spaghetti squash, pumpkins, corn, flowers, okra, butternut and acorn squash. Then we left for a bit of traveling to Ireland and left everything to grow for a couple of weeks. 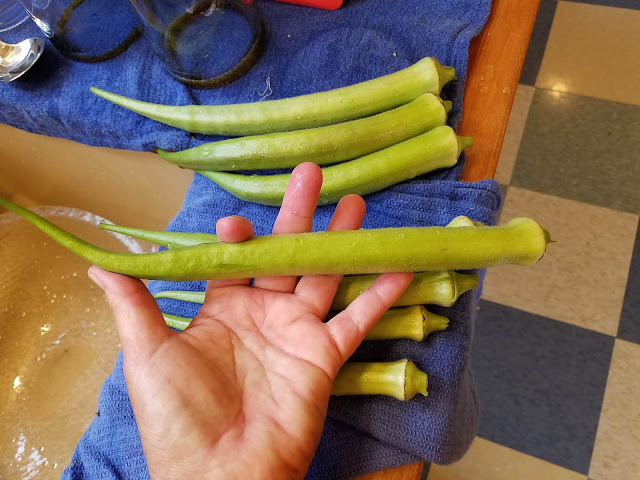 Grow is the action word of this blog. Everything just grew and grew! By July 4, we started having cucumbers and tomatoes everyday. 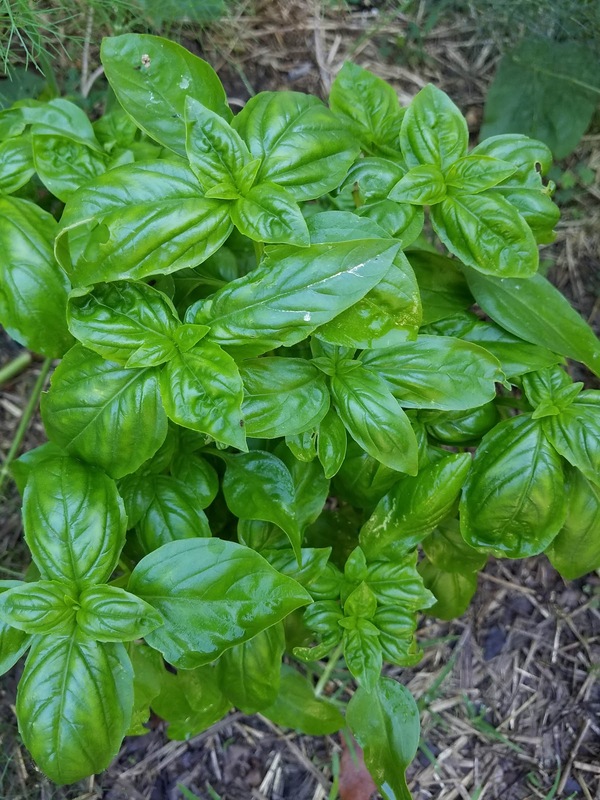 I kept trimming the basil and rooting the trimmings so that now we have a good twenty plants scattered around the different plantings. We don't use pesticides and guess what, the squash bugs came in force! We tried diatomaceous earth and although we had a brief respite, I didn't keep up with it after every rain. 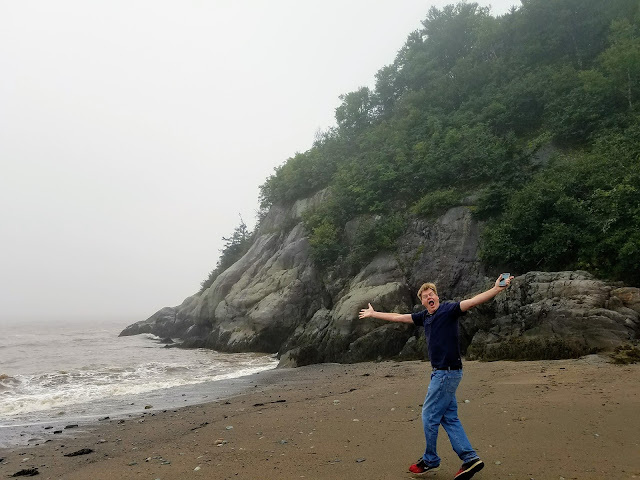 (we had a lot of rain!) So several of our cucumber plants succumbed to the pests. 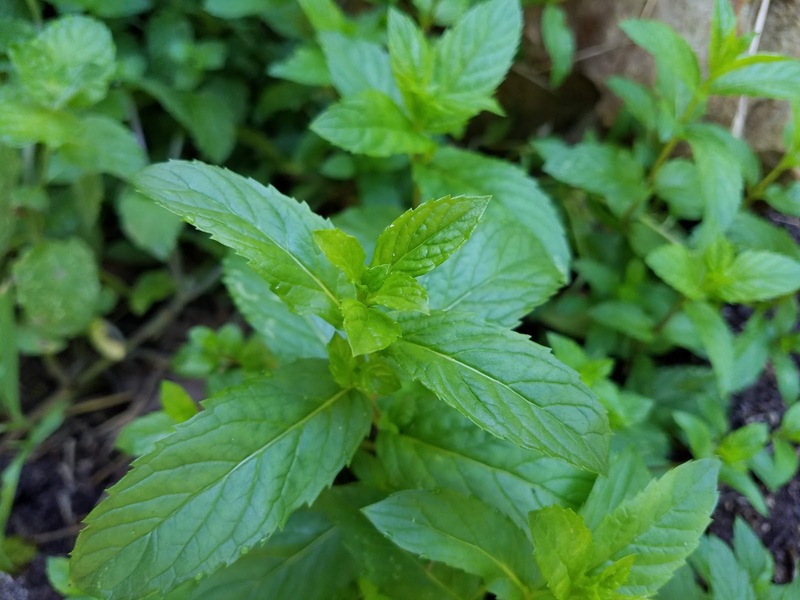 Have to have mint growing! However, over all we are having a great year. 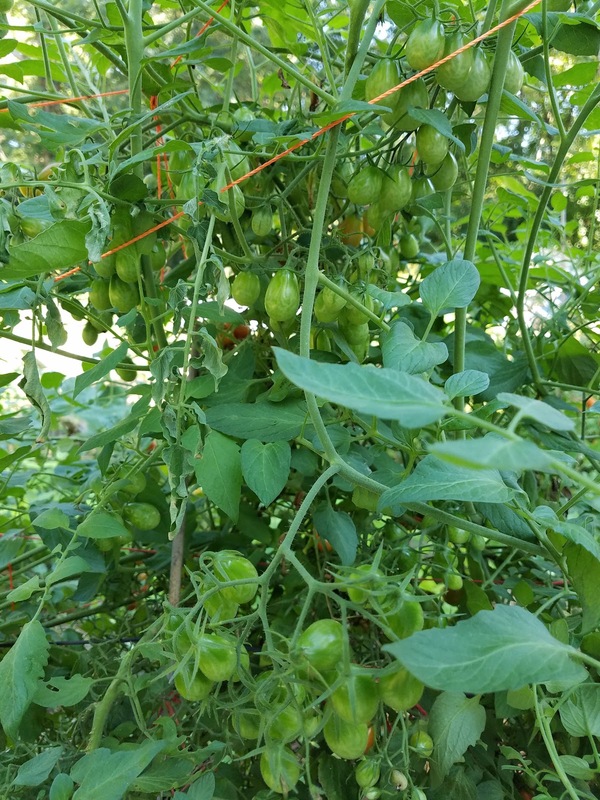 Our cherry tomato plants are well over ten feet high and have produced maybe thirty pounds of gorgeous little jewels with lots yet to come. 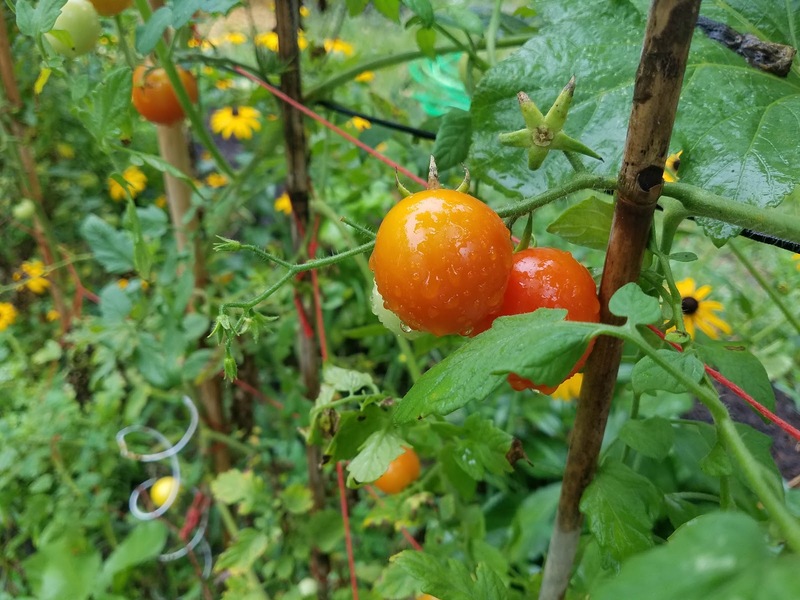 Our golf ball sized tomatoes were just as productive and after eating them everyday through the summer, giving away lots to family and friends and canning them up to tomato paste, we still have plenty ripening. Our plum tomatoes are the slowest to ripen and they are producing like the world is about to end! Tomorrow, I start making salsa to add to our winter stores. 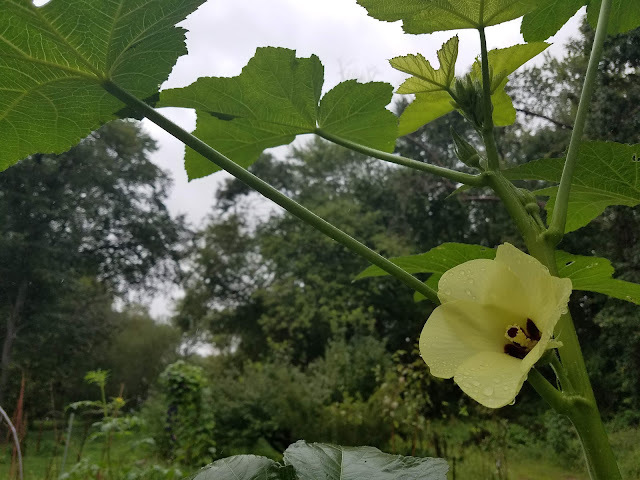 A new plant to me is our okra. I read that it had striking flowers that were a nice a addition to the landscape and so I planted a few seeds. Only two grew and they have been such fun to watch. Their flowers are gorgeous and the seed pods are so cool. I have been adding them to our curries and sautes. We tried a type of kale that we saw folks in the UK grow through winter, called Walking Stick Kale. 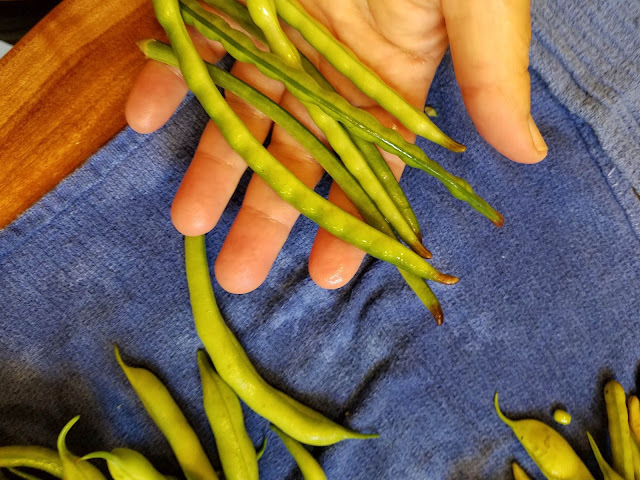 We harvested the leaves daily until the slugs found that they enjoyed the plant as much as we did. The plant keeps sending out new shoots so I hope that I will win the battle against the slugs. Tried growing black eyed peas from beans on my shelf and they grew! 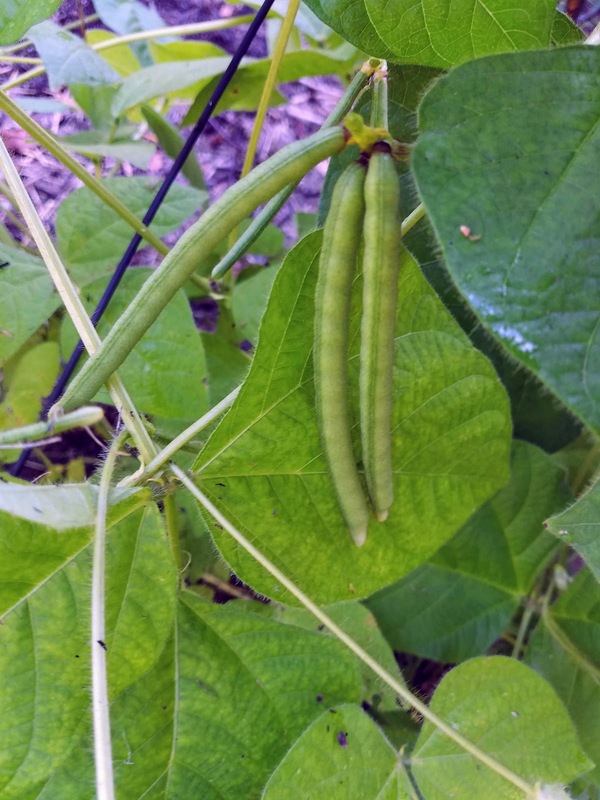 Never grew mung beans before. You know those cute little white butterflies that flutter around the garden? Well, we saw them fluttering about in the early summer and naively enjoyed seeing more and more of them until we found out that they were laying eggs on our cabbage plants and within a week or so had stripped the leaves. Then we noticed that wasps were swarming the plants and killing off the larvae. We have so much to learn! Growing vegetables instead of lawn is more work, but we know we are improving the soil. 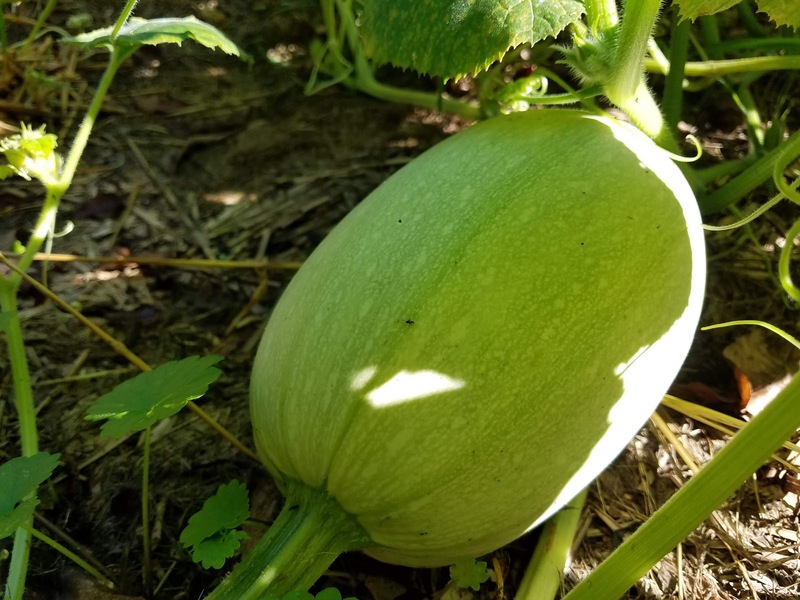 Our perennial fruits and nuts are growing well. This spring I decided to focus on increasing our supply of elderberries and blackberries and planted scores of cuttings. This elderberry cutting is thriving. 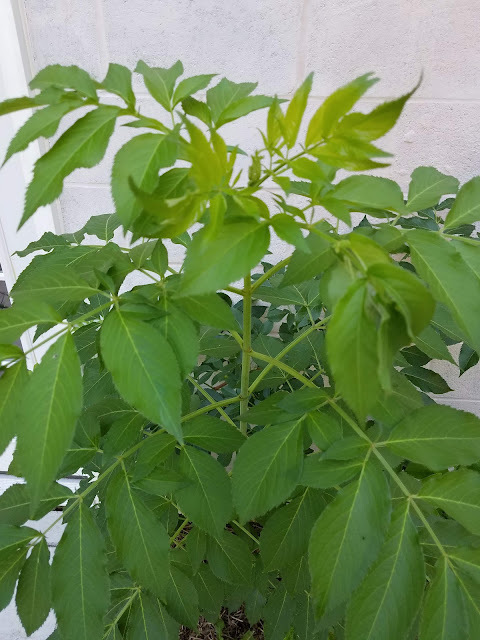 The elderberries did the best and we now have probably seventy-five plants started around the house that will grow into ten foot tall bushes, further reducing the area of lawn. 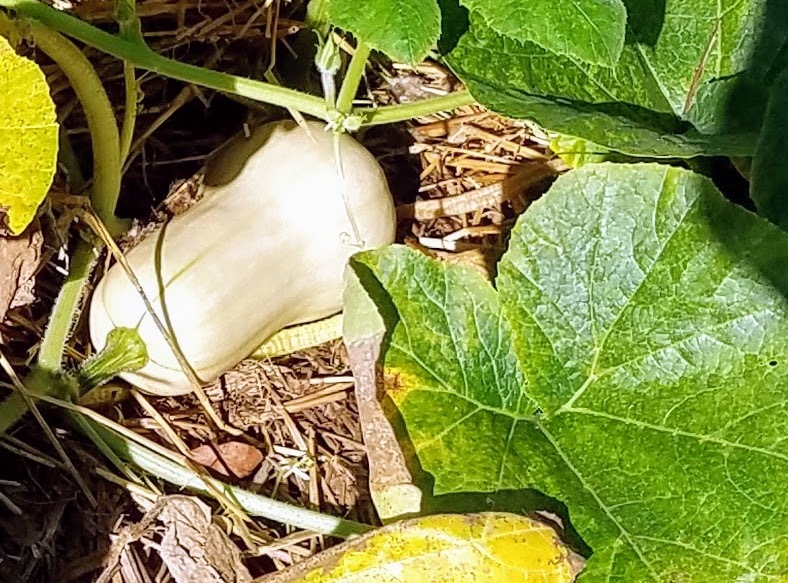 Eric planted a butternut squash seed he found on the kitchen floor and it grew! Only about ten blackberry cuttings rooted, but I am not too worried about them as I know that they will produce suckers quickly once they get big enough. 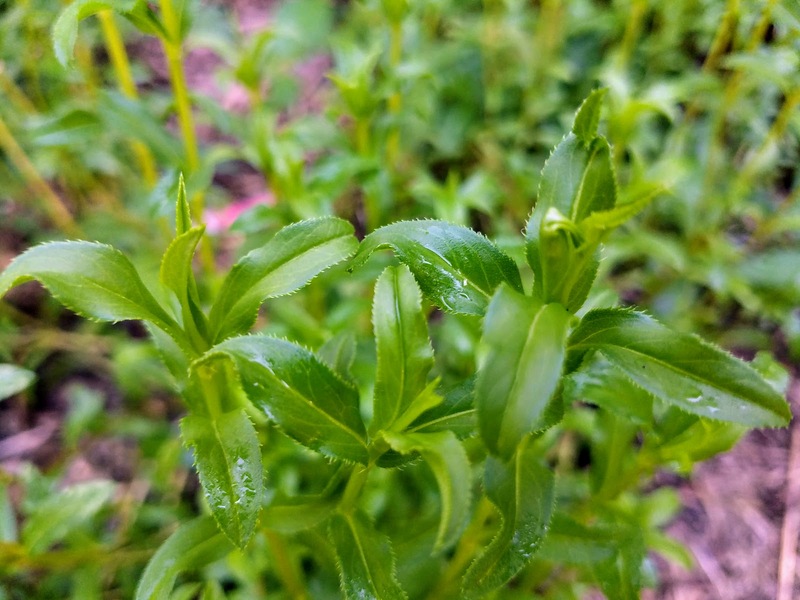 Mexican marigold tastes and smells just like tarragon and is much more hardy. We still struggle with our young orchard of apples, pears and lots of plums. There are a few shade trees that we might have to sacrifice to get a little more sun overhead. We tried transplanting a chestnut tree but a period of dry weather and a lack of attention from me did it in. Our pecans grew well this year and we look forward to some nuts maybe starting next year. 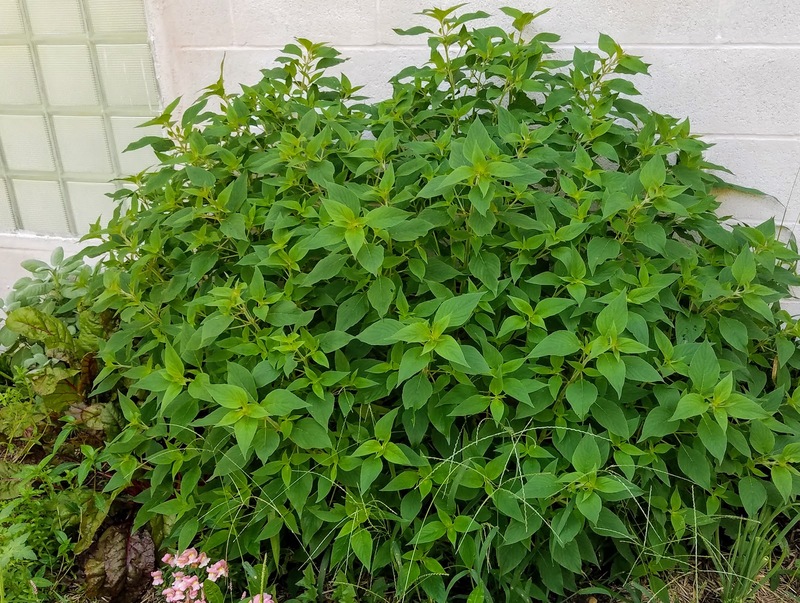 Pineapple sage. It smells like pineapple and will soon blossom into bright red flowers. I could go on, but this gets tedious. My point is that our experiment of growing something productive instead of lawn was quite successful. We did fail at some plants and need to educate ourselves more, but look forward to an even better year next year as we strive to improve the microbial life in our soil. 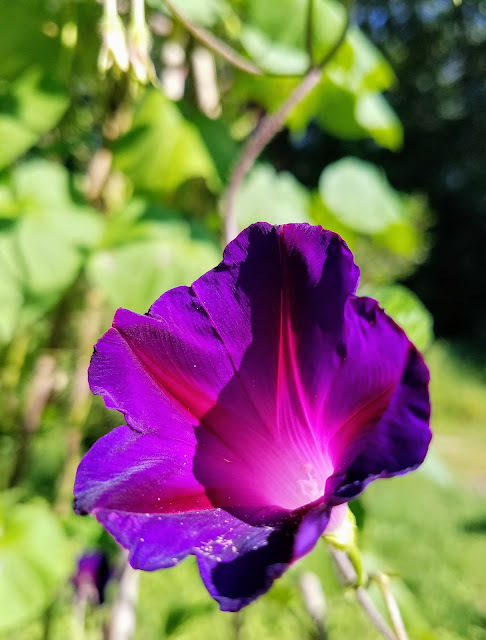 This might be invasive but it's so beautiful in the morning! 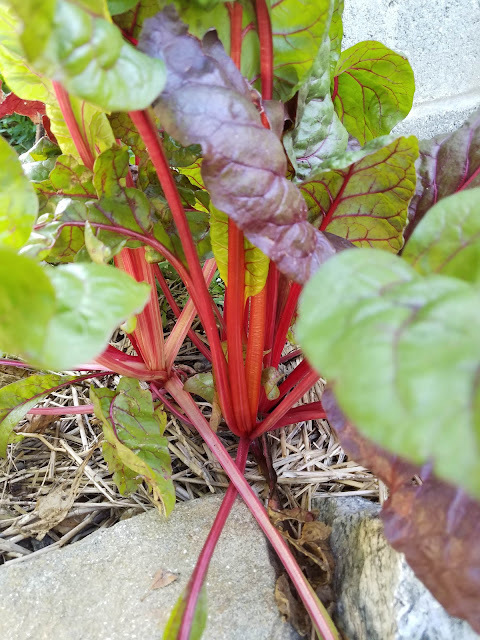 Swiss Chard, not my favorite vegetable but it's pretty. Morning glories took over the cucumber tower. I realize that many months have passed since I have updated this blog of mine. Well, today I will try to start being a little more diligent with writing. Everything had to be put on hold until the lift was finished. That sounds so lighthearted and simple - "Just wait until the house lift project is done." I guess we did not realize, nor should we have expected to, just how involved that would be. So anyhow, long story short is that we are now in full swing of tackling all the projects, and not one at a time like normal sane folks! The carpets are out - well some of them. Our living room floor is beautifully refinished. Our kitchen - well, we really did a job on that! That will have to be a blog on it's own. Check out the cliffs along Elk Neck State Park! So what did we do this Labor Day when we could have spent work-free time to catch up on some projects? 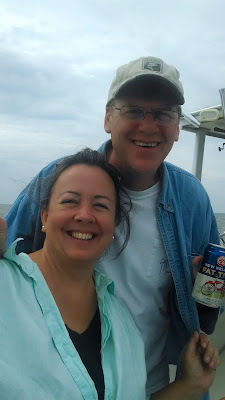 We went sailing! Glorious, carefree and almost irresponsible fun! As you know from previous posts, we bought a sailboat to live in while we had our house lifted. It was a fun time. 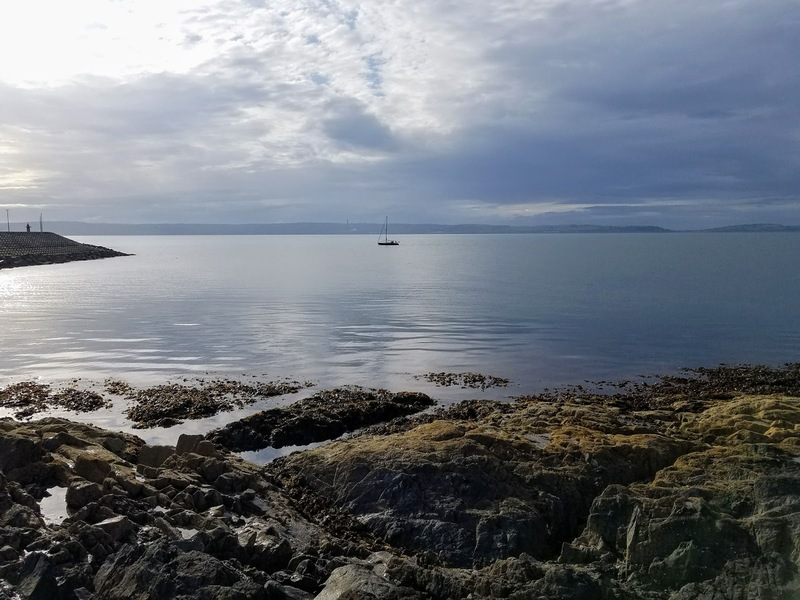 That sailboat still sits in the water at the end of our driveway and we use it from time to time, but only for day sails. We have dreamed of taking it out down the Chesapeake Bay and visiting all the little villages and coves and rivers, but never made the time to actually do it. 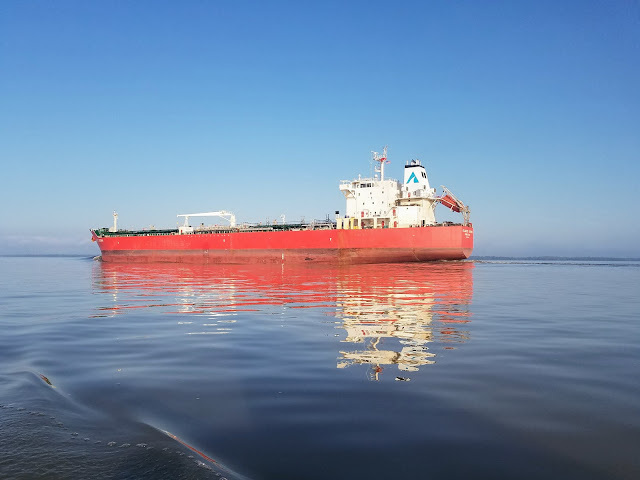 Huge tankers were amazing to see. A few weeks ago, we plotted a course, made reservations in a couple of marinas, checked the weather a hundred times and then set the date for Labor Day Weekend. Friday, we prepped the boat in the rain, making sure that our quarters were freshly washed. We woke up early on Saturday and brought down our food supplies, linens and clothes and headed out. The air was fresh and clean after the rain and the skies were still clouded over. The sun broke through after a few hours. We motored quietly out of our creek, noticing only a couple fishermen along the banks, until we passed the limit of where we usually turn back on our day sails. A nice breeze of about seven to ten knots prompted us to turn off the motor and let the wind pull our good old boat down the river. 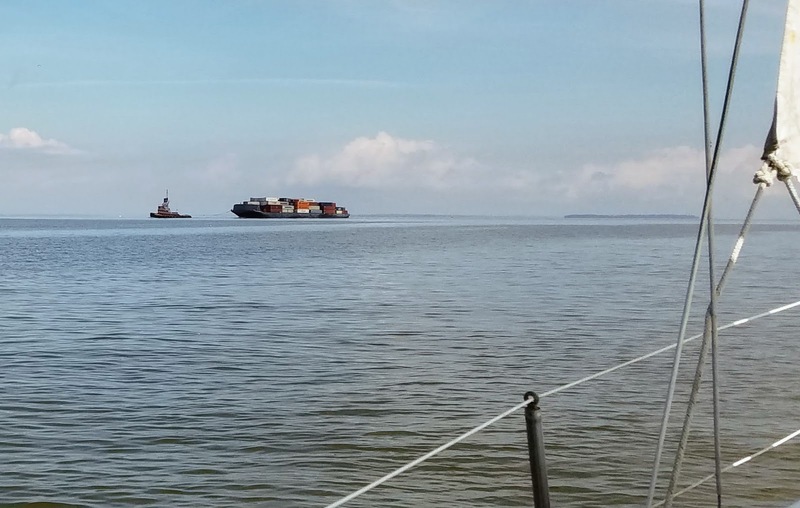 Amazingly, after an hour or so, we realized that we were sailing straight on course without having to tack back and forth. 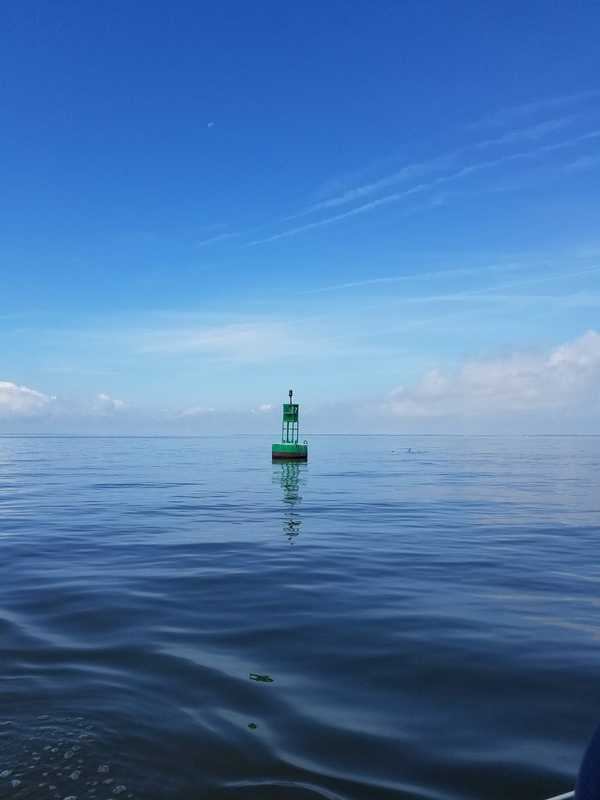 With the wind at our backs, we left our familiar waterways of the Northeast River, past the mouth of the Elk River, beyond the Sassafras River and Still Pond, then the town of Betterton as we hugged the Eastern shore, staying in the well marked channel. Aberdeen lands seemed to stretch on forever, and still the wind pulled us along, sometimes with more speed that we were used to but our old boat stayed steady. 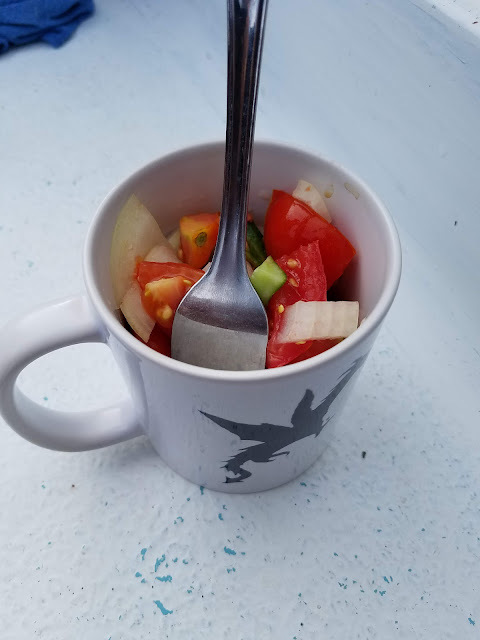 For breakfast, we enjoyed a little tomato and cucumber salad fresh from our garden, but in our new mugs I ordered to match our sailboat. Speaking of which, we came up with a new name for our boat that seems to match its origins - Knucker. Why? Our boat was built in Wales in 1969 under the brand of Snapdragon. Knucker comes from the Old English, Nicor which means "water monster" - the name seems to fit as the boat is chunky and heavy but strong in the water. We lost signal for our plotter app as we moved down the Bay, but were not too worried as we had a good idea of where we were going. Google maps kept updating our location for us and although at one point Eric was sure we were headed straight for Rock Hall, but then we realized we were still several hours north. 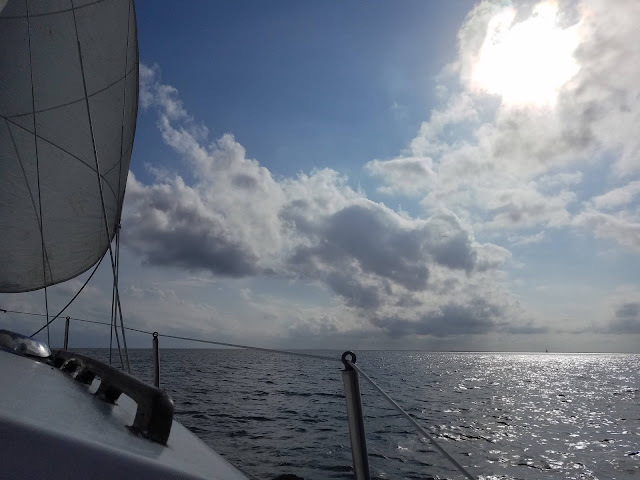 The sun came out between the clouds around three and as we moved past the area of Tolchester Beach, the wind died down a bit so we motored for about an hour. Although the slow sailing was fine, we didn't want to pull in to our scheduled marina stop after dark. For lunch we ate a chickpea curry leftover from our previous night's dinner, even better tasting the day after. 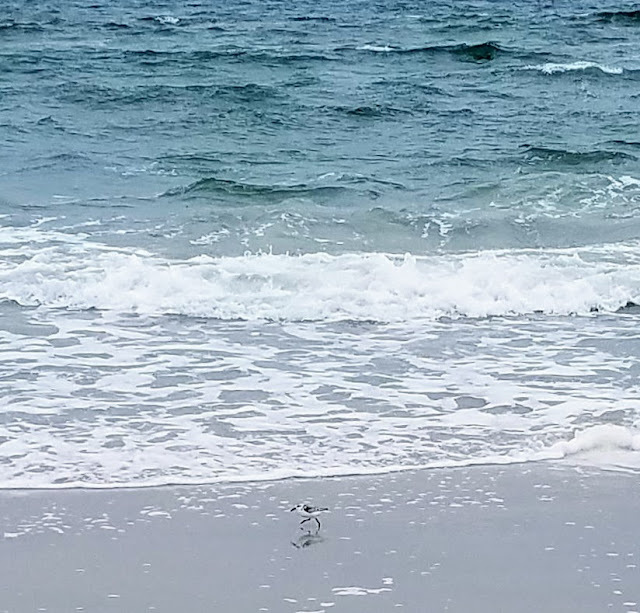 We could hear music coming from the shore but enjoyed the distance between us and the band. Massive tankers moved by us through the channel on their way to or from the C and D Canal. Eagles and ospreys glided overhead and crab traps kept us on the lookout on the water. 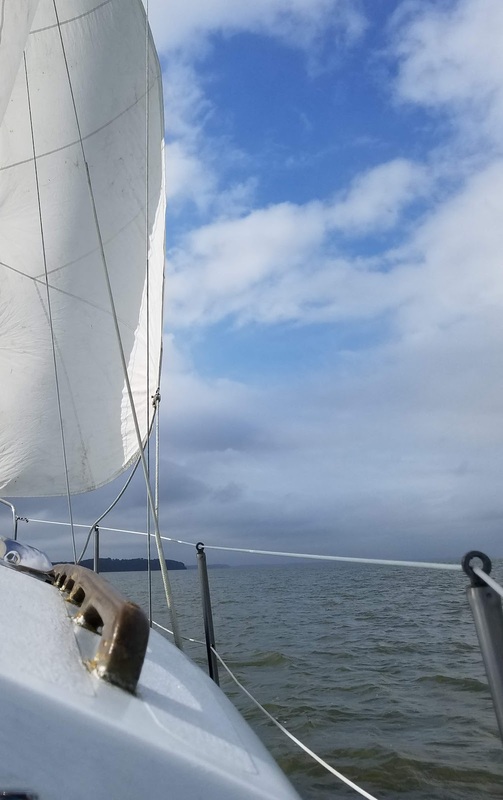 The wind kicked up again as we approached Swan Creek Point and we let the sails fly. As our family knows, we are novice sailors and when the boat starts leaning too much, we usually pull back to slow down the speed. With this wind, we found ourselves enjoying the speed in the open water. With the point for Rock Creek in view around five o'clock, we hugged the shore, not realizing that there were no boats near us. We heard a strange clunk noise under the boat and thought we hit a log but couldn't see anything. 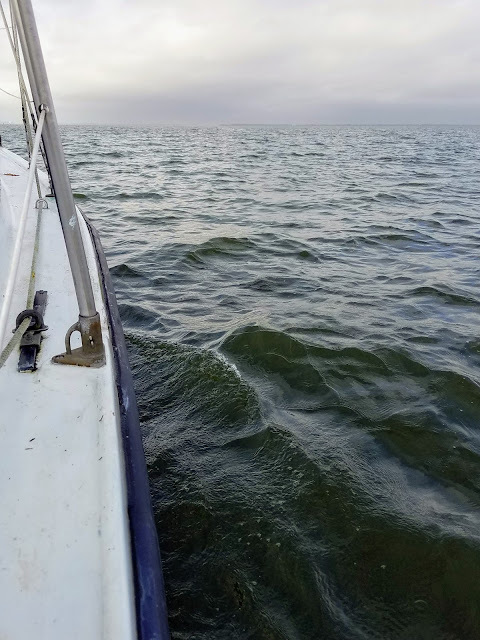 The second time we heard the same noise, quickly checked the depth of the water and were shocked to find we were sailing in under three feet of water. Now our boat only needs 28 inches of water but we were dragging the dual keels on the bottom! While steering at a right angle to the shoreline to find the deeper water, we pulled up our charts and recognized our blunder as we saw the markers for the channel almost a mile from the land. The wind was strong and we aimed for a mile beyond the point where the waters were deep enough to turn into Rock Hall. Lots of sailboats were flying along with us. It was glorious until we tried to make the turn only to find the boat did not want to cooperate as the wind was too strong. 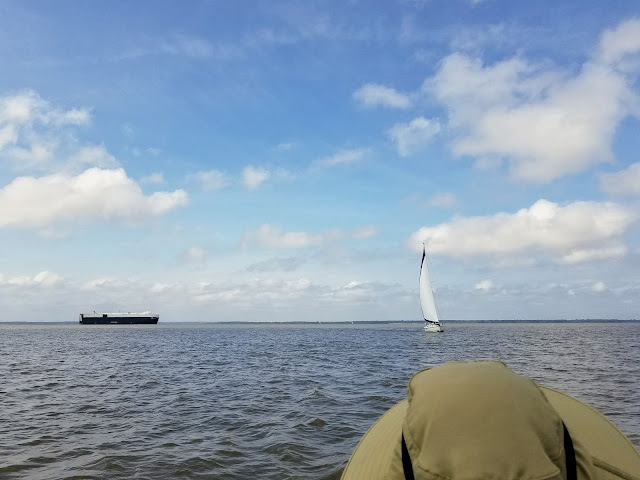 Our speed became uncomfortable and even though we could turn enough to steer into the wind, we struggled to drop the sails, but Eric held on and we managed. 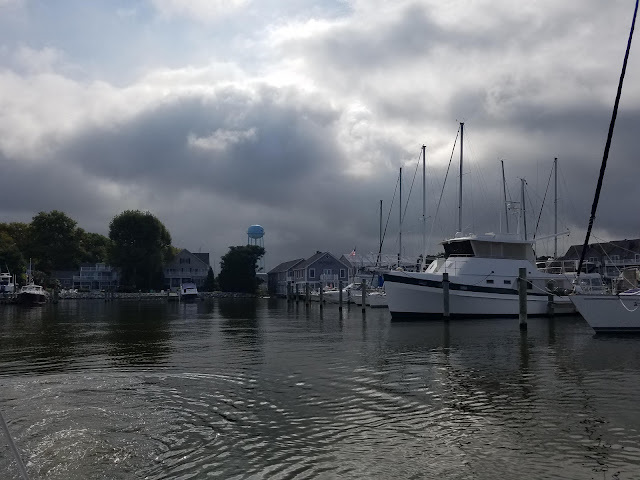 We started up our trusty engine and motored quietly into Swan Creek Marina were we tied off to a mooring for the evening. 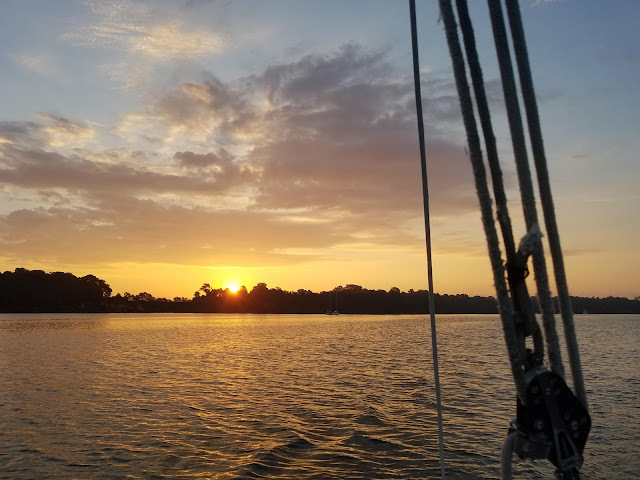 After ten hours of mostly sailing, we enjoyed the cool and quiet evening (apart from the clanging of our ropes against the mast which Eric was finally able to quiet with some finagling.) Our beds were comfortable and we slept easily. The following two days were not really great for sailing as the wind died, but we enjoyed just motoring our boat. 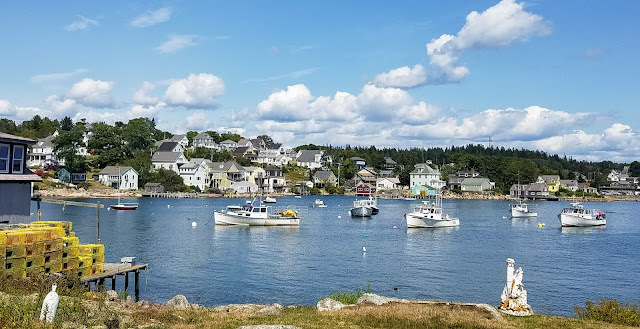 We found some little marinas that were fun to pull into for lunch and dinner. Sunday night was almost a catastrophe though as the temperatures didn't drop much after sunset and then the mosquitoes came out in force. The ol' boat is not equipped with air conditioning but we did have an electric fan. Eric was able to situate the boat in the almost dark, so we could reach our ship-to-shore power cord from the dock to the boat. 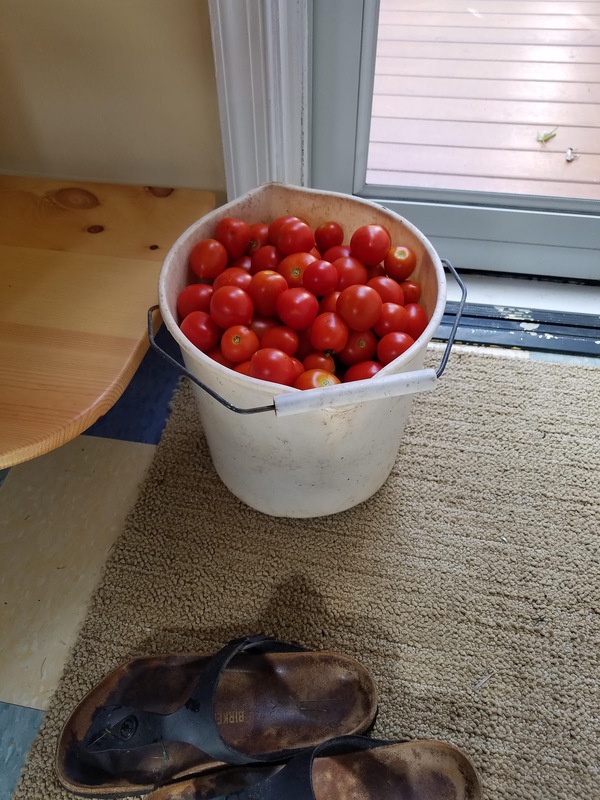 I was a basket case of heat and bug bites and did little to help as he saved us from a night of misery. He shut the windows and turned the fan on full blast so we could sleep. That was a part of our adventure that made the rest seem wonderful! 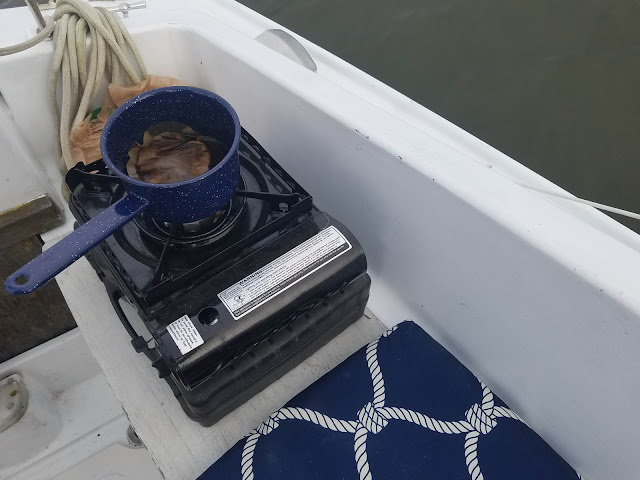 We motored out before sunrise and enjoyed our coffee underway. The waters were like glass and we powered through straight to home, making it back just after midday when the heat was scorching hot. Our air conditioned home felt like heaven, and we realized how a good adventure can make the ordinary seem wonderful again. Morning sunrises on the water are breathtaking and constantly changing.